Are you looking for a Charles Tyrwhitt review or a shirt fit guide? This page contains a detailed review of Charles Tyrwhitt (pronounced “Tirrit”) shirts and all the cuts and sizes available. The page has detailed actual garment measurements (and how they have changed over time) unique to this website. 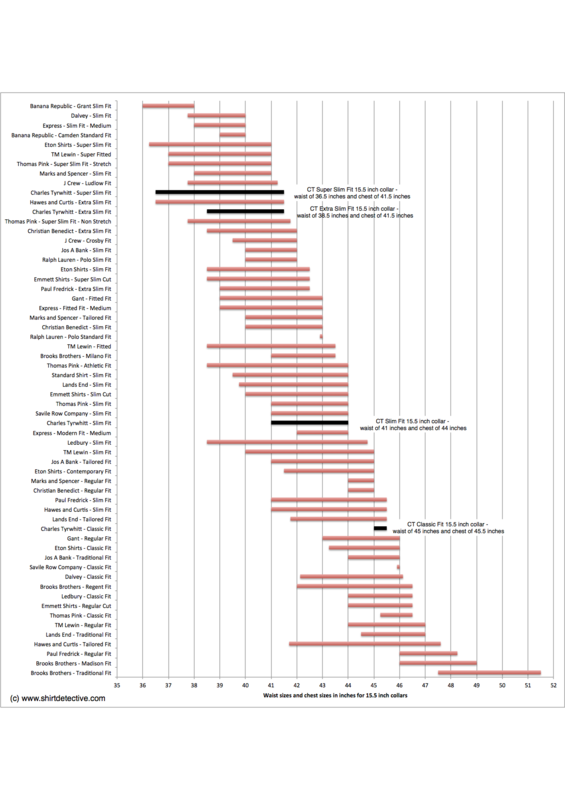 I have updated the data below to take account of the sizing changes made in September 2016. You can buy Charles Tyrwhitt shirts from the Charles Tyrwhitt UK and US sites by clicking on the links below. 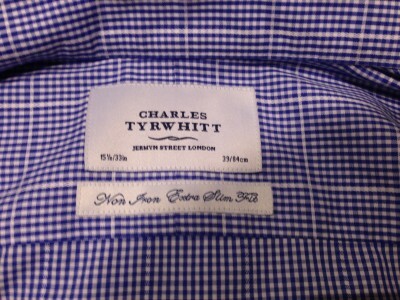 CT shirts is another terms used for Charles Tyrwhitt shirts. Four different cuts of shirts are available from Charles Tyrwhitt. Classic Fit shirts are Charles Tyrwhitt’s widest cut around the chest and waist. Slim Fit cut is narrower around the chest and waist. Extra Slim Fit shirts were the narrowest Charles Tyrwhitt shirts. Super Slim Fit shirts, these were launched in August 2017. They have the same chest size as the extra slim fit, but are narrower through the waist. A summary of how Charles Tyrwhitt 15.5 inch collar shirts compare to other shirt manufacturers is given in the image below. If you’re looking to compare Charles Tyrwhitt shirts with other brands (for example, Charles Tyrwhitt shirts are typically much more fitted than Brooks Brother shirts), then go the compare shirts page. Shirts that fit like Charles Tyrwhitt shirts? Shirts that fit like Charles Tyrwhitt Classic Fit include the Savile Row Company Classic Fit. Shirts that fit like Charles Tyrwhitt Extra Slim Fit include the Charles Tyrwhitt Super Slim Fit. Shirts that fit like the Charles Tyrwhitt Super Slim Fit include the Hawes and Curtis Extra Slim Fit. All shirt manufacturers I know of insert an interlining into the cuffs and collars of their shirts to make them more robust. Charles Tyrwhitt use semi-fused interlinings, which means that their collars and cuffs have an interlining which is fused with the cotton of the shirt. 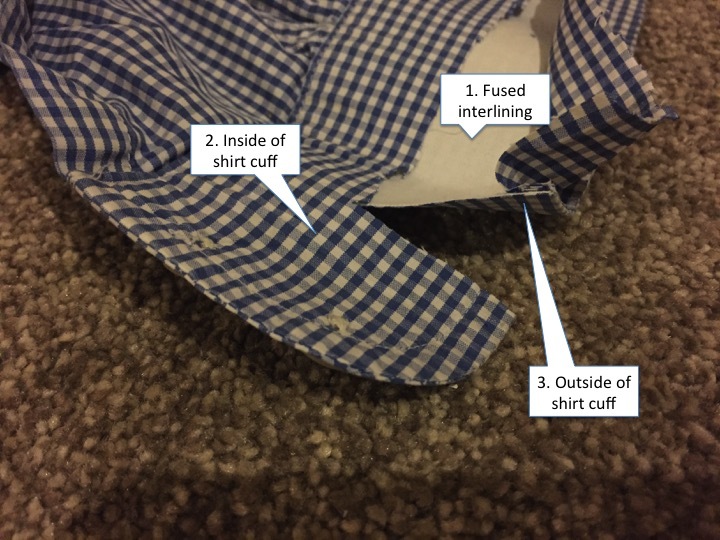 The image below shows a Charles Tyrwhitt shirt I took apart. The image shows the fused interlining (1). The interlining is separate from the material on the inside of the cuff (2) and fused to the outside (3) of the shirt cuff. This is called semi-fused as the interlining is only fused to the outside. If the interlining was fused to the outside and inside it would be called fully fused. 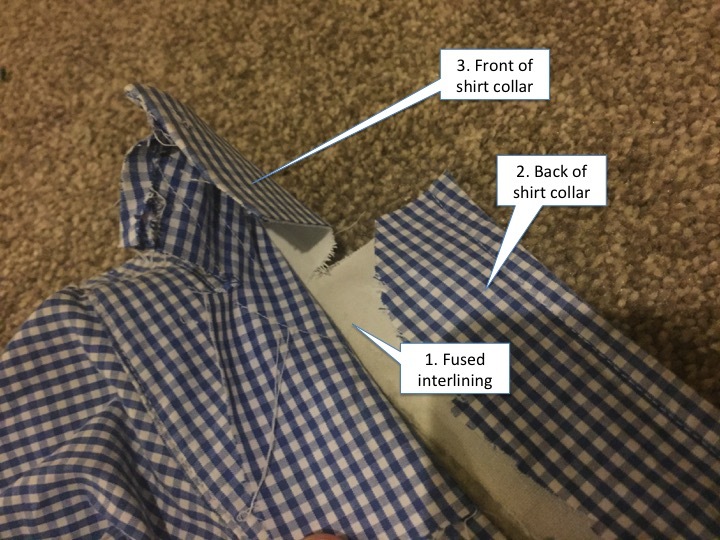 The image below shows the collar of the same Charles Tyrwhitt shirt. The same construction technique is used: the interlining (1) is separated from and not fused with the back (2), but is fused to the front (3) of the collar. At the start of 2015 Charles Tyrwhitt updated their website and changed some of their shirt sizes. The old data for chest sizes is below and may be useful if you’re purchasing shirts which are from their earlier ranges. The diagrams below show the recent changes and that Charles Tyrwhitt has substantially slimmed the waist and chest measurements on the smaller collar sized Extra Slim Fit. In addition to these changes, Charles Tyrwhitt told me that the other main change was the sleeves, which were slimmed down. The Extra Slim Fit chart shows that for the 14.5 inch collar, the smallest, the chest size has gone from 40.2 to 37.5 inches. The waist has gone from 36.6 to 34.5 inches. In the tables below No info. means this information was not previously available. 19.0 57.0 No info. No info. 20.0 59.0 No info. No info. 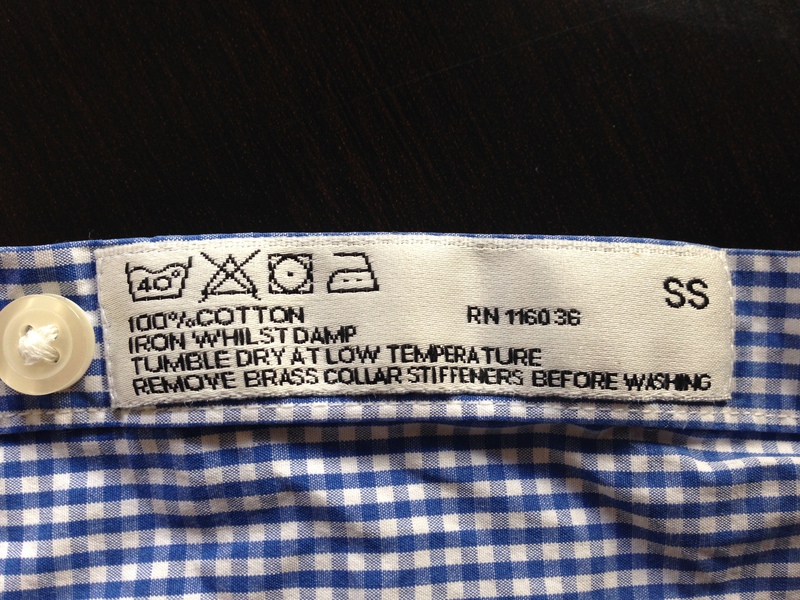 In Summer 2013 Charles Tyrwhitt slightly changed the information on the sizes of their shirts displayed on their website. Information on the old sizes, which is likely to be more applicable for second hand shirts, is below. In 1986 Charles Tyrwhitt started as a mail order business. Nicholas Charles Tyrwhitt Wheeler started the firm while studying geography at Bristol University. Before focusing on shirts, Nicholas Wheeler started businesses involving Christmas trees, photography and shoes. His shoe business originally involved tracing around customers’ feet and faxing the result to a factory in India. The company was started with £8,000 of inheritance, a bank loan and profits from the sale of an Aston Martin (Nick bought it for £17k and sold it a year later for £100k). From 1986 it took eleven years until the first shop was opened on Jermyn Street, London. Today Charles Tyrwhitt has stores in the UK, the USA and France. Charles Tyrwhitt review – where are the shirts made? It’s difficult to find good information on where Charles Tyrwhitt shirts are made and the label on the most recent shirt I bought doesn’t say anything. Nor does this label, on a shirt I looked at in March 2013. The shirt fabric originally came from Lancashire in England and the shirts were made in Essex. Then production moved to Hong Kong. The website doesn’t give any detailed information on where the shirts are made, but says that products are made in the China, Czech Republic, Hong Kong, Indonesia, Italy, Malta, Peru, Philippines, Sri Lanka,Tunisia and the UK. This article says the shirts are made in India, Romania, Peru and other places. Charles Tyrwhitt shirts are also made by Esquel, which has production facilities in China, Malaysia, Vietnam, Mauritius and Sri Lanka.